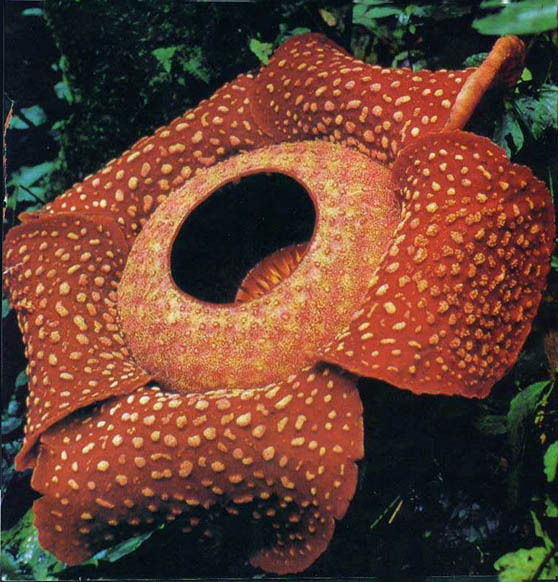 Species named after Dr. Joseph Arnold, a physician who explored Sumatra with Sir Stamford Raffles in the early 1800s. 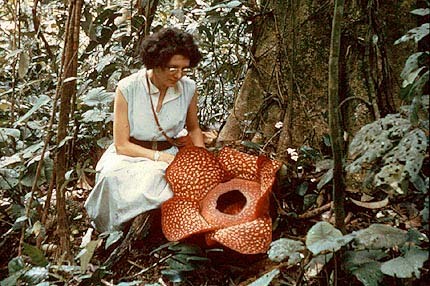 Often spelled Rafflesia arnoldii, Mahyuni et al. (2015) explain “The correct orthography of the epithet is ‘arnoldi’, as was used by Brown, not ‘arnoldii’ as is usually found. Arnold may be considered as a personal name with a well-established Latinised form under Rec. 60C.2. Saint Arnoldus of Soissons." 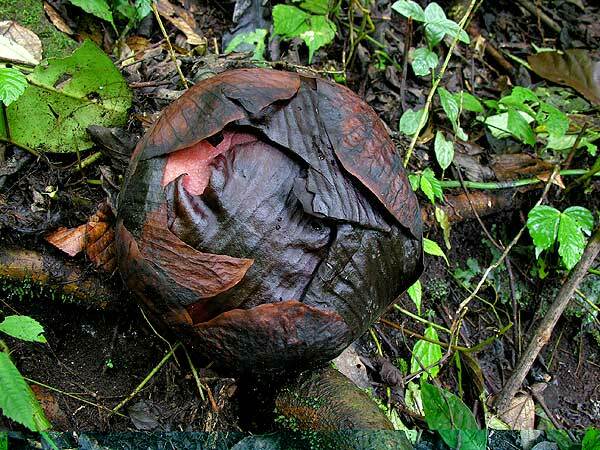 The following photos were taken by Mr. Davis who formerly maintained a web site called SumatraFlora - On-Line Nursery. 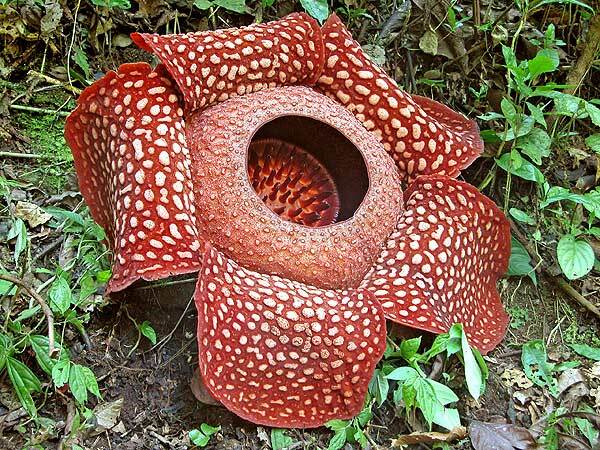 This site is no longer available, but at the time he provided a number of photographs of interesting plants from Sumatra, including Rafflesia arnoldi. 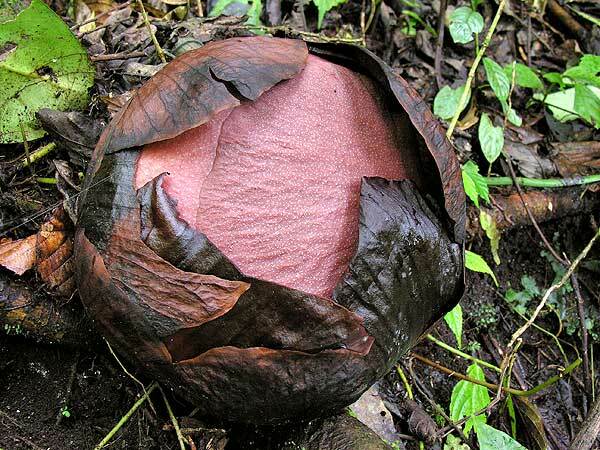 The nine photos below were taken in the Palupu Reserve near Bukittinggi, Indonesia. 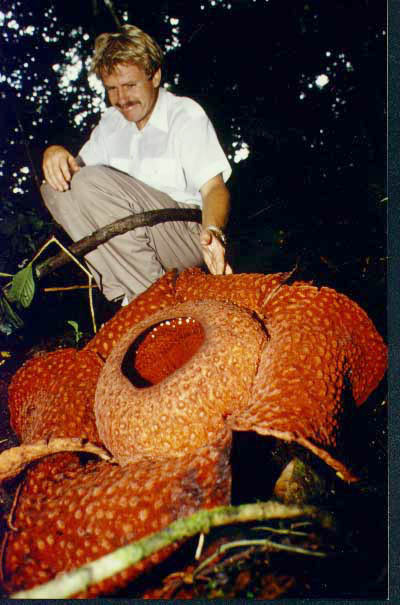 Fully open flower of Rafflesia arnoldi. Flower bud, in a later stage of opening. 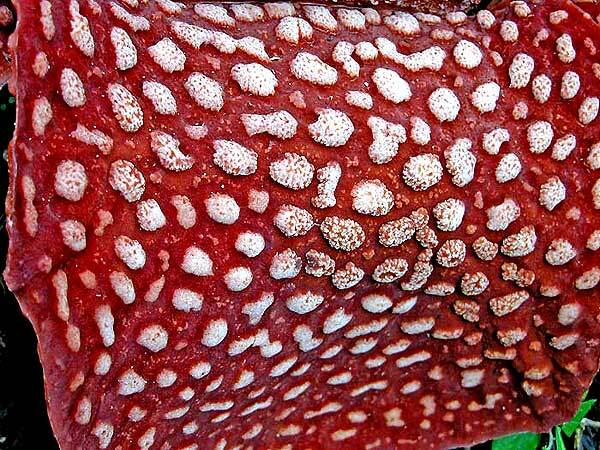 Flower bud, with scales still unexpanded. 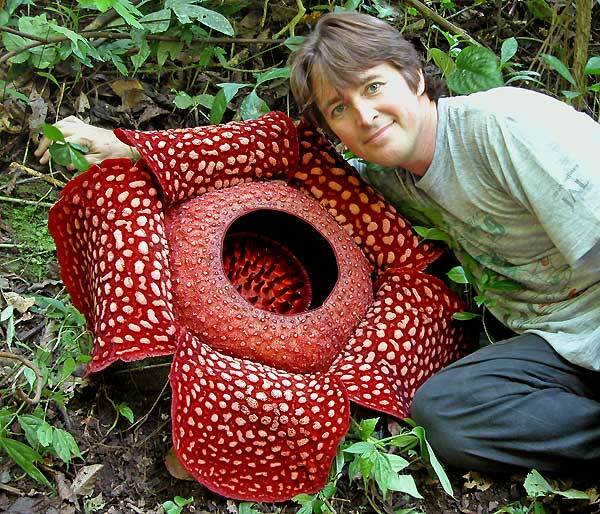 Fully open flower with Troy Davis included for scale! 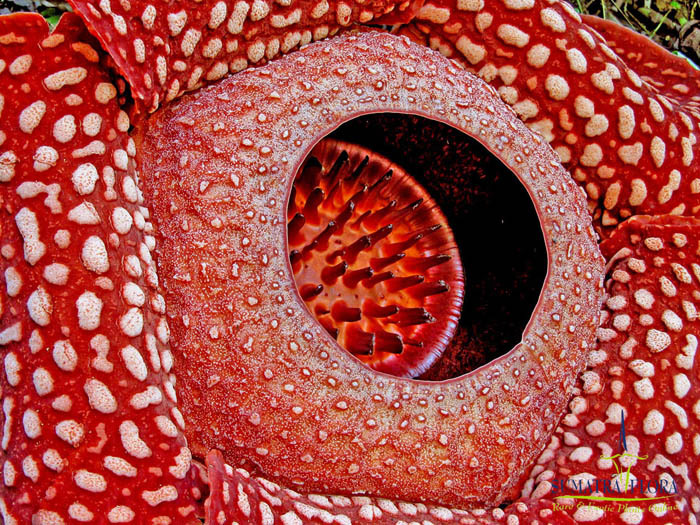 Closer view of the flower showing the diaphragm surrounding the floral opening. 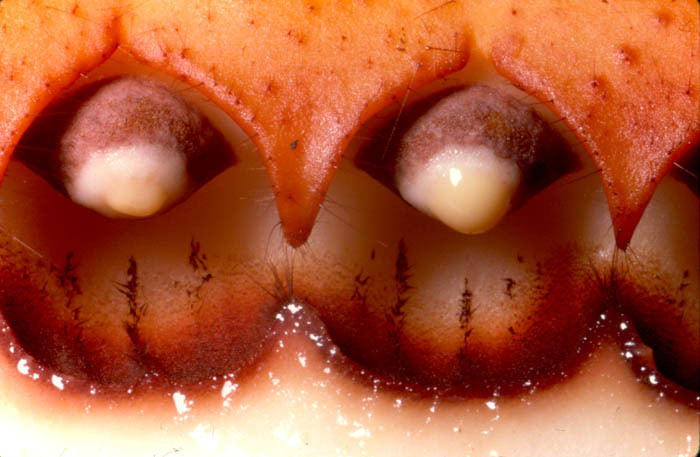 Close-up of the perigone lobe showing the pattern. Top view of the disk showing the processes. 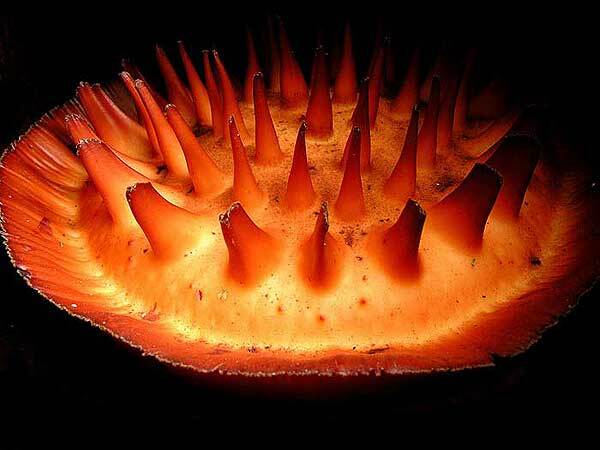 Side view of the disk from a dissected flower. 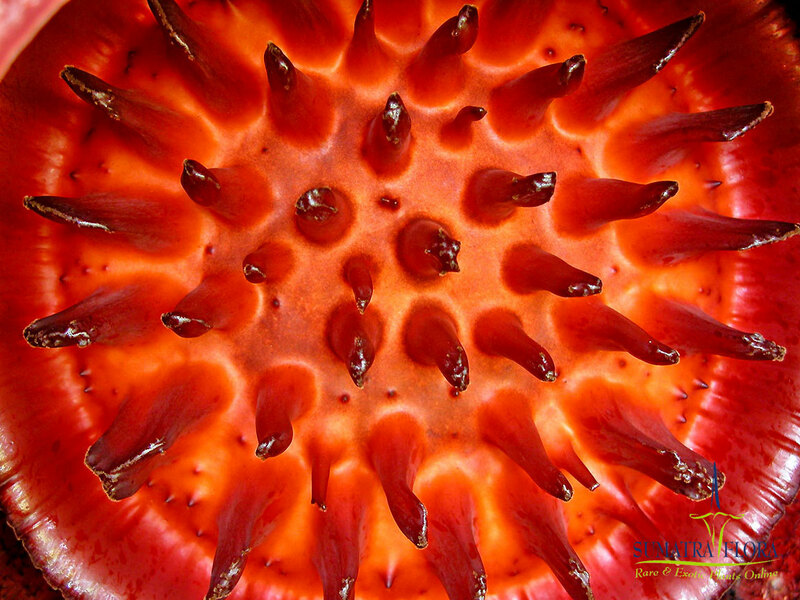 View from inside a Rafflesia flower. Trond Schumacher (University of Oslo) and R. arnoldii. Photograph by Harry Wiriadinata (email: herbogor@indo.net.id) and Suwito Alam from article in "Voice of Nature" (ISSN No 0216-4177), Vol.84, Aug. 1990, page14. The photo below was taken by Alwin Gentry ca. 1956 on Mt. Sago at the L Hulaban Tea Estate, Sumatra. 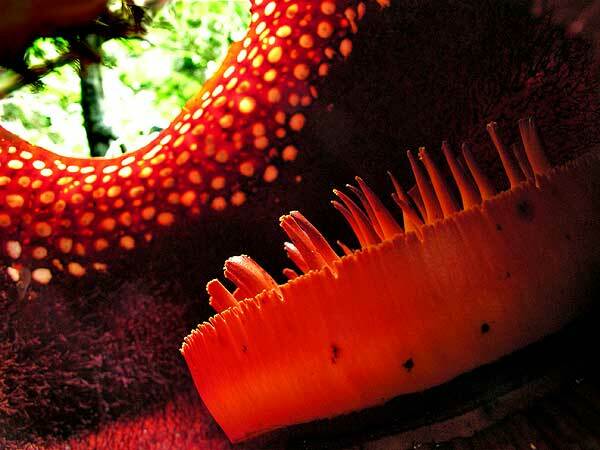 Close-up view of two Rafflesia anthers dehiscing the pollen in a sticky fluid. Mt. Sago, Sumatra. Photo by E. S. Ross July 23, 1983.